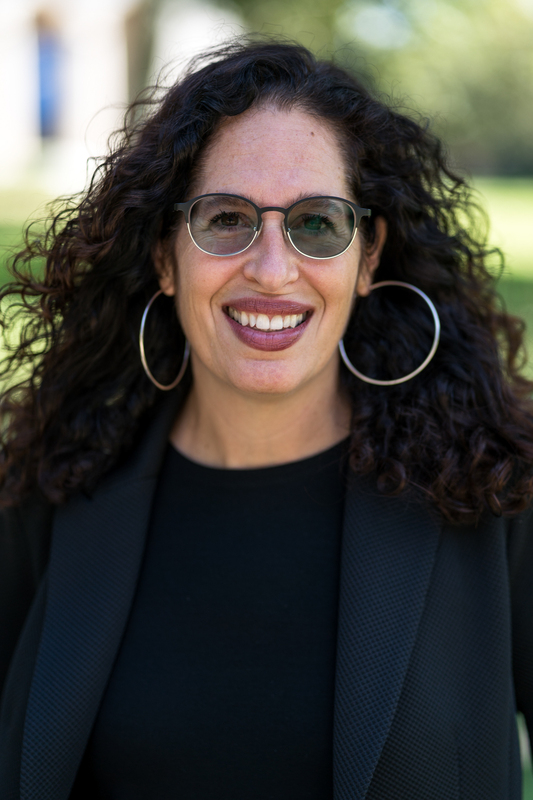 With over 25 years of teaching in Chicana/o-Latina/o Studies, sociology, and women’s studies, Ochoa has worked with K-university teachers and has also taught in high school and college programs dedicated to increasing the number of underrepresented students in higher education. In the classroom, she strives for interactive and transformative learning spaces, and she regularly collaborates with teachers on various college-high school student-centered projects. She has received teaching awards from Pomona College and UCLA, and in 2016, she was named the Susan Currier Visiting Professor for Teaching Excellence at California Polytechnic University, San Luis Obispo. She is a frequent presenter and has delivered keynote addresses and workshops at colleges, conferences and school districts on topics ranging from ethnic studies to critical pedagogy, identity, racism and education. 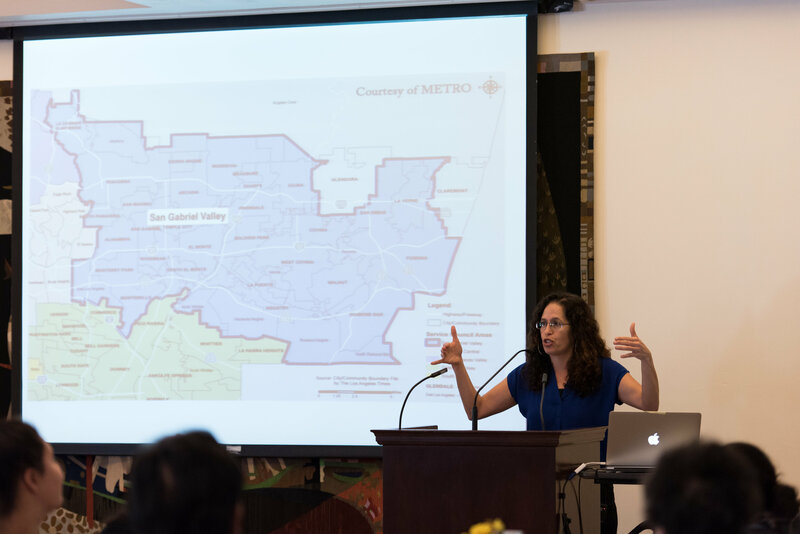 As a community-engaged teacher, Ochoa has been involved with multiple struggles, most recently in the sanctuary movement in the nearby city of La Puente. "Ochoa reflects on her latest work on sanctuary and community organizing"
Ochoa shares her background and research interests in an interview published on Esteem, an online journal for educators. 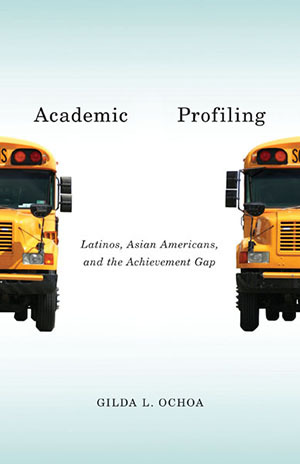 Academic Profiling: Latinos, Asian Americans, and the Achievement Gap (University of Minnesota Press, 2013). Learning from Latino Teachers (Jossey-Bass, 2007). Becoming Neighbors in a Mexican American Community: Power, Conflict, and Solidarity (University of Texas Press, 2004). With E.C. Ochoa (eds. ), Latino Los Angeles: Transformations, Communities and Activism (University of Arizona Press, 2005). Ochoa, Gilda L., E.C. Ochoa, and S.G. Portillo (co-editors). “Reframing Immigration in the Américas,” Special Issue of Diálogo: An Interdisciplinary Journal. Center for Latino Research at De Paul University, fall 2015. "Family Separation and Detention: A Rant" and Other Selected Poems, Latinx Spaces, August 7, 2018. “That’s Just Like Here, at Our College’: Tracking Latina/o Inequality from High School Programs to Honors Colleges,” New Directions: Assessment and Preparation of Hispanic College Students, co-edited by A. G. de los Santos, G. F. Keller, R. Tannenbaum, and A. Acerada. Bilingual Press Hispanic Research Center, Arizona State University, 2018, pp. 123-139. “Ode to the Class of 2017: In the Midst of So Much Inequality,” Latino Rebels, May 24, 2017. “'I’m Watching Your Group': Academic Profiling and Regulating Students Unequally,” Beyond Black and White: A Reader on Contemporary Race Relations, edited by Z. Valdez. SAGE Publications, Inc. 2016, pp. 208-222. “Getting to the Foundations of Hate in Our School,” Inland Valley Daily Bulletin, November 15, 2016. Ochoa, Gilda L. “Framing the ‘Gap’: Dominant Discourses of Achievement,” Gender Through the Prism of Difference, co-edited by M. Baca Zinn, P. Hondagneu-Sotelo, M. A. Messner, and A. M. Denissen. Oxford Press, 2015, pp. 459-475. Ochoa, Gilda L. “Gendered Expectations and Sexualized Policing: Latinas’ Experiences in a Southern California High School,” Inequality, Power and School Success, edited by Gilberto Q. Conchas and Michael Gottfried. Routledge, April 2015. With E. C. Ochoa, “Campus Protests are the Result of Generations of Racist Exclusion.” Truthout Speakout, November 25, 2015. Ochoa, Enrique C. and Gilda L. Ochoa. “The Ties that Bind: Ferguson and Ayotzinapa” Counter Punch, December 12-14, 2014. Ochoa, Gilda L., Laura E. Enriquez, Sandra Hamada, and Jenniffer Rojas. "(De)Constructing Multiple Gaps: Divisions and Disparities Between Asian Americans and Latinas/os in a Los Angeles County High School," Transnational Crossroads: Remapping the Americas and the Pacific, edited by C. Fojas and R. P. Guevarra, Jr. University of Nebraska Press 2012, pp. 143-170.
de los Ríos, Cati V. and Gilda L. Ochoa. “The People United Shall Never Be Divided: Reflections on Community, Collaboration, and Change,” Journal of Latinos and Education 11, 4 (September 2012): 271-279. "Immigration, Sports, and Resistance: An Interview with Carlos Borja,” Rethinking Schools, Summer 2012. “Transformational Caring: Mexican American Women Redefining Mothering an Education.” Chicana/Latina Mothering, edited by Dorsía Smith Silva. Demeter Press at York University 2011, pp.104-121. “Teaching is a Fight: An Interview with Sal Castro,” Rethinking Schools, Winter 2010-11. “(Re)Conceptualizing Race/Ethnic Relationships in US Schools,” Sociology Compass 4, 2 (February): 136-148, 2010. With D. Pineda, "Deconstructing Power, Privilege, and Silence in the Classroom," Radical History Review 102 45-62, 2008. With E.C. Ochoa, "Framing Latina/o Immigration, Education, and Activism," Sociology Compass 1, 2 (November): 701-719, 2007. "Pump Up the Blowouts: Reflections on the 40th Anniversary of the Chicana/o School Blowouts,” Rethinking Schools, Summer 2008. "Entre Nosotras/os: Theorizing, Researching, and Constructing Cross-Latina/o Relations," Latinos/as in the United States, edited by Havidán Rodríguez, Rogelio Saenz, and Cecilia Menjivar. Springer Press 2007. With E.C. Ochoa, "Education for Social Transformation," Latin American Perspectives 31 (1): 59-80, 2004. “Researching Where We Live: A Latina Feminist Reflection on Becoming Neighbors and Claiming Voice,” Keynote for Gender, Sexuality & Women’s Studies’ Feminist Seminar, UC Davis, April 2017. “Abolishing Academic Profiling and Building Affirming Spaces, Keynote Address for Annual Summit for Courageous Conversation," Austin, TX, September 2016. “Moving Mountains, Building Bridges: The Power of Local-Global Learning,” Keynote for Montebello United School District First Annual Global Learning Conference, Montebello, CA, May 2015. “Disrupting Dominant Constructions of Education,” Presentation for Showcase Oregon: Incorporating Best Practices in Equity, Inclusion, and Diversity, University of Oregon, Eugene, May 2014. “Abolishing Academic Profiling, White Supremacy, and White Privilege in Our Schools.” White Privilege Conference, Madison, WI, March 2014. “Educational Access and Justice for All: Learning from Latina/o Teachers and Students,” Keynote Address for Faculty and Staff In-Service, College of the Desert, Palm Desert, CA, January 2012. “Unpacking Latina/o Diversity and Building Authentic Relationships,” Keynote Address for Irvine Foundation Arts Regional Initiative, San Luis Obispo, March 2011. “Improving Race Relationships in Schools,” Featured Speaker for California Association for Bilingual Education (CABE) Conference, Long Beach, CA, February 2009. “Schooling for Justice: Contesting Power, Privilege, and Exclusion in Education,” Faculty and Staff In-Service, Columbia Basin Community College, Washington, September 2008. “Chicana/o School Blowouts: A Legacy of Exclusion and Resistance,” Civic Justice: The Activism of ELA Walkouts, La Plaza de Cultura y Artes, Los Angeles, July 2018. Professor Ochoa's book examining education inequalities between Asian American and Latino high school students. Professor Ochoa signs copies of her book Academic Profiling. 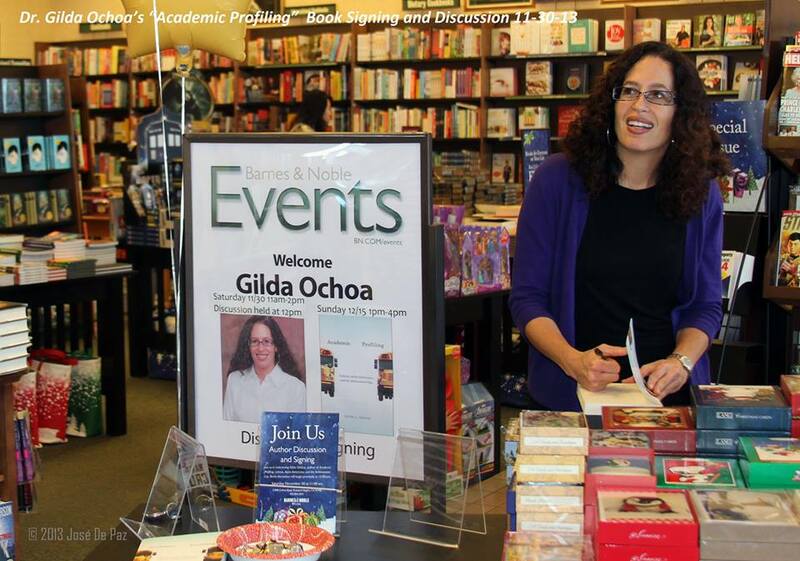 California Edition Host Brad Pomerance interviews Professor Gilda Ochoa about her book Academic Profiling.